Dozens of people died after drinking toxic alcohol over the Christmas weekend in the Punjab region of Pakistan. The development came one week after tainted liquor in Russia caused more than 70 deaths. The alcohol was reportedly procured by two Muslim men, both of whom were among the dead, for a holiday party in Toba Tek Singh and was distributed mostly to Christians on Sunday. It is illegal for Muslims to purchase alcohol and minority religions such as Christians must obtain a permit to do so. In response to the country's strict liquor laws, many Pakistanis have resorted to making their own home-brewed alcohol. "The men who belong to the Christian community drank liquor on the night of Dec. 25 and went home. Tragedy struck the next morning when many did not rise from their beds, while others got sick," Police Officer Mohammad Nadeem told BBC Urdu. Local liquor stores were reportedly out of booze for Christmas, leaving the two men tasked with providing the alcohol to get it "from somewhere else," according to local authorities. The latest death toll was at least 32 with dozens more injured, some of whom had to have their stomachs pumped. Authorities have also said the maker and supplier were killed in the incident, the Australian Associated Press reported. The news followed another tainted alcohol incident in Pakistan's Punjab region in late October when 11 were killed in the district of Jhelum, about 200 miles northeast of Toba Tek Singh and about 78 miles southeast of Islamabad. Bootleg brews have also killed hundreds across neighboring India in the last several years. Last week, more than 70 people died after drinking "surrogate alcohol," cheap herbal or chemical-infused liquids such as bath oils, in the Siberian city of Irkutsk, Russia. Liquor becomes hazardous for consumption when methanol, or methyl alcohol, as opposed to normal ethanol, or ethyl alcohol, is introduced to the mix. Toxic alcohol consumed by Christians in a small town in Pakistan to celebrate Christmas is responsible for at least 31 deaths, according to reports. Dozens more people got sick in the incident in the small city of Toba Tek Singh, located in the northeastern part of the country, according to the Associated Press and the New York Times. Pakistan maintains tight restrictions on the consumption of alcohol, but allows the practice for non-Muslims. Still, many Christians in the country cannot afford properly produced goods and instead rely on homemade alcohol. The regional government has launched an investigation into the incident, according to the Times. Several similar incidents of tainted alcohol in the country have left dozens dead. MULTAN, Pakistan -- Police say the death toll from consuming tainted liquor during the Christmas holiday in eastern Pakistan has jumped to 27. Local police officer Atif Imran Qureshi said Tuesday that dozens of people were transported to hospitals in the town of Toba Tek Singh in Punjab province after they consumed contaminated alcohol. At least 45 people were treated for poisoning, the Reuters news agency reported. A total of 15 people died, and another 12 people died elsewhere the day before. “The maker and supplier of the toxic liquor is also included among the dead,” Bilal Kamyana, a senior police official, told Reuters. “The maker prepared liquor at home and sold it in polythene bags for 500 rupees (about $5) each,” Kamyana continued. Alcohol is prohibited in Muslim-majority Pakistan, but Pakistani laws allow non-Muslims to purchase alcohol from licensed shops. Most poor Christians buy homemade liquor - which is more affordable but causes deaths almost every year. 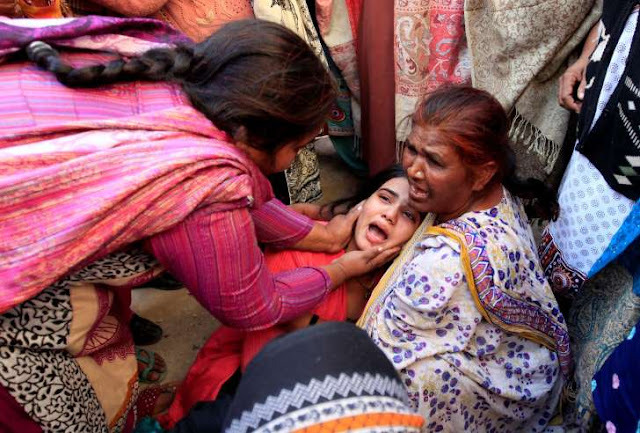 0 Response to "Dozens Die From Tainted Liquor In Pakistan"